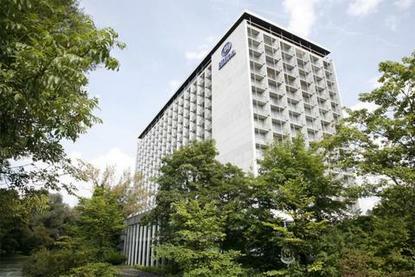 Stay in central Munich, next to the English Garden, at the Hilton Munich Park hotel. Just 30 minutes' drive from the airport, the Hilton Munich Park hotel offers 21 meeting rooms for up to 1020, business center, Executive Lounge and wireless internet access. Enjoy a steak at the Hilton Munich Park hotel's Tivoli Restaurant and Club. Sip a beer in the People's Bar or a coffee in Kaffeeklatsch Lobby Caf?. De-stress with a workout, a swim in the pool or a sauna and massage at the Hilton Munich Park hotel's health club. Then treat yourself to a new look in the shopping arcade and hair salon. Play golf, go horseriding, hire a boat or visit Munich attractions like the English Garden. From Hilton Guest Rooms to Executive Rooms, all have balcony and wireless internet access. Opt for an Executive Room for use of the 12th-floor Executive Lounge, with sweeping views of Munich.